Situated on the west coast of the Island of Flores, on a small plateau overlooking the mouth of the Ribeira Grande River, municipality of Lajes, the Aldeia da Cuada is one of the most beautiful azorian sceneries. A place where time stood still and where nature performed its best, leaving it untouched and full of life! 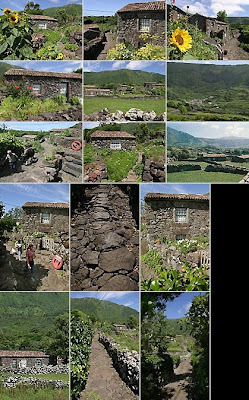 At the Aldeia da Cuada only the stone walls and the basalt cottages stand out amongst the verdant fields, where the fresh smell of flowers and fruit trees drift. The places surrounding the village suggests outings of true expectations and sheer pleasures. Close by, a mere 2 kilometres away, you will find the seaside town of Faja Grande, one of the most sought after summer spots on the Island of Flores; where a deep blue sea invites you to an invigorating swim. After having worked up your appetite the local restaurant will be pleased to serve you some of the island´s famous dishes. At night, in the silence of this small sanctuary, you can almost hear the sound of the sun falling against the horizon...afterwards, everything seems even more serene, but at the same time more intense, fragrant, inexplicably captivating, as if part of a poem. Looking at places that my ancesters came from, your pictures and content are beautiful and helpful!